LG are teasing yet again with some basic specifications and photos of the new "Chocolate" phone, the LG BL40. We first had a glimpse of this handset three weeks ago, but now we have a few more details. The main thing to notice is the BL40's screen - it's a huge 4" 800 x 345 pixel panel, almost identical in terms of size and resolution to the Nokia E90. On the back is a 5 megapixel camera with flash and Schneider-Kreuznach optics. The front-facing camera on the BL40 indicates that it's a 3G phone, and a close look at the icons indicate the probable presence of WiFi and an FM radio in addition to all the usual features. The LG BL40's on-screen buttons indicate that this is a touchscreen device, and it works in both wide and tall orientations. It's an unusually tall phone, looking rather like.. well, rather like a bar of chocolate. LG didn't specify the exact size, but we think that it comes out at something like 128 x 52 x 11mm.. again, not far off the size of the E90 but about half the thickness. The 800 pixel wide 12:9 ratio screen is definitely a huge advantage when it comes to web surfing, but LG's "Real VGA" technology promises to deliver bright, sharp video playback too. LG also say that the BL40 comes with a "Dual Screen UI" which allows it to display two different types of content at the same time. 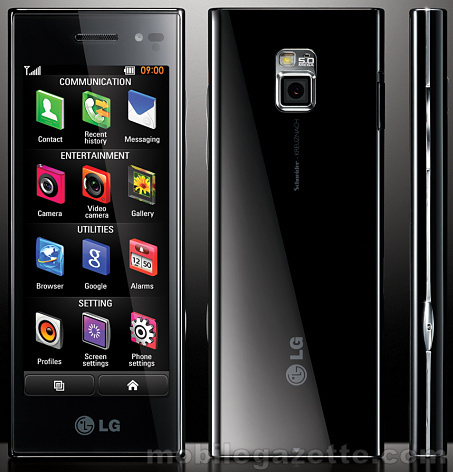 LG say that the BL40 should be available during Q3 2009 in 54 countries. There's no word on pricing at the moment, but we would guess it will be expensive. Presumably LG will give more details closer to the launch date.